From the Batmobile to Knight Rider’s KITT, futuristic supercars have captured adult and adolescent imagination alike for generations. You may be more a fan of the souped-up vehicles of “Death Race 2000” or the more grounded tricked out rides of the “The Fast and The Furious” franchise, but we guarantee some Hollywood-style car has caught your eye and affixed itself permanently in your brain. You might be focused on the here and now of your car and it’s modification or issues, but fueling the imagination never hurts. For those of you in our CorkSport community who always thought Speed Racer’s powerful Mach 5 was dope, you’re going to love this new concept Mazda: the Mazda Shinshi. The Mazda of the Future? Designed by Barcelona’s Miguel Angel Bahri, the Mazda Shinshi looks ready for the mean streets of “Akira’s” Neo-Tokyo. “After the initial thoughts, the challenge was to develop a concept inspired by the Japanese culture,” Nahri explains. 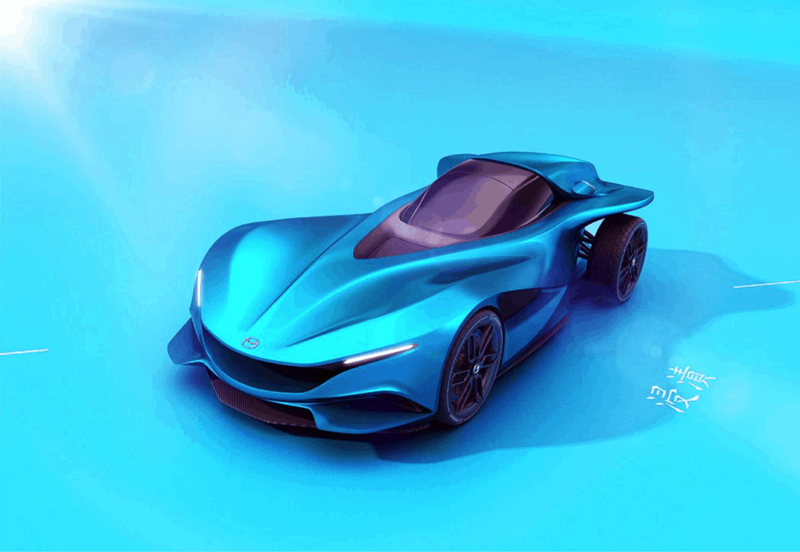 “Taking, also, influence from nature and the ocean, with the stingray and the samurai’s DNA serving as a bridge to connect the SHINSHI proposal with Mazda’s design philosophy.” You can delve into all his influences and design process more deeply, from fighter pilots to James Franco, but we think he’s delivered on his inspiration in spades. With 4 in-wheel electric motors and integrated systems, Bahri didn’t just look at a sleek exterior, he put some attention to performance, as well. 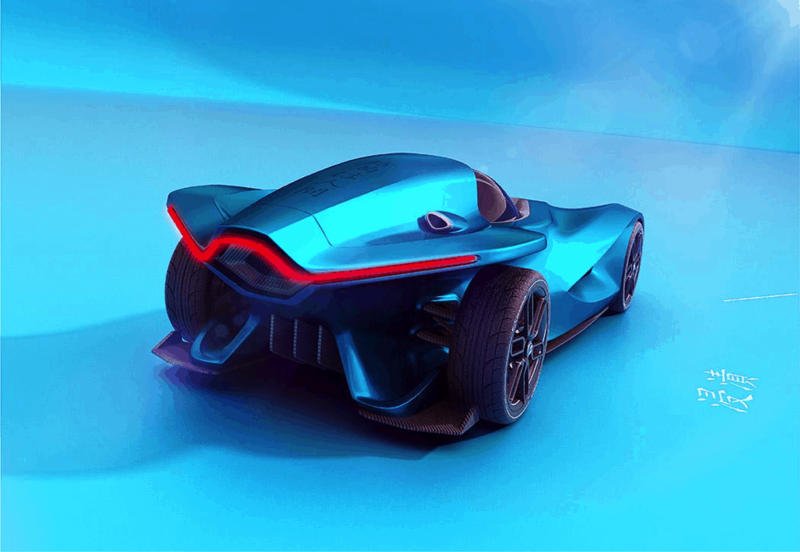 The wheel systems are fed by a graphene-optimized supercapacitor and a rotary bio-fueled engine boost that main battery for a clean energy car that might make you scoff, until you see his specs have it max out at 310 kph (192 mph) — still some good race track fun to be had from this environmentally-conscious concept car! Get ready to Top Gun this ride, Maverick! The feature that really makes this design feel futuristic, though, is the flight control-like steering wheel. How a wheel like this really functions on the road is pure speculation, but you’ve got to admire the design sense. 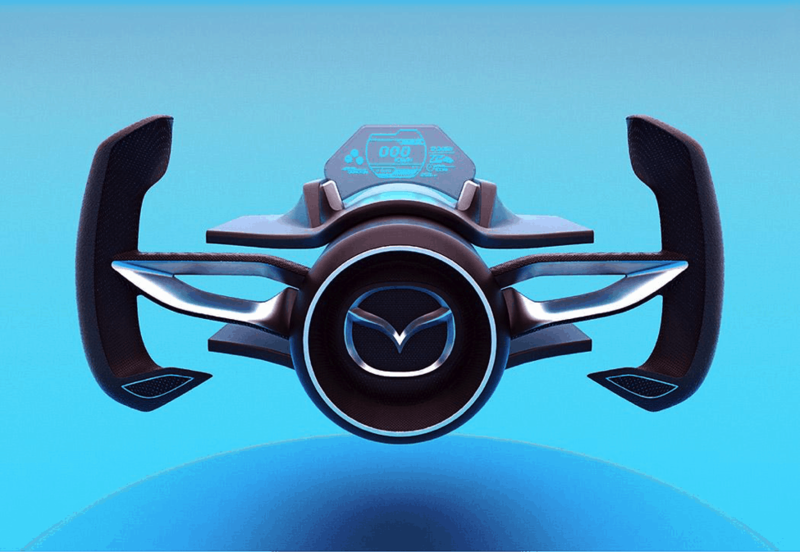 “Blade Runner”-style flying cars might be many years away, and — let’s be honest — would probably take the fun out of curve-hugging road driving, but a Mazda that makes you feel like a test pilot would be worth a test drive, at least. What do you think of the Mazda Shinshi concept? Too high tech? Just right? Let us know in the comments below. And keep following the CorkSport blog for more modification advice and tips, Mazda lifestyle talk, and — as the arise — speculation on far out Mazda concepts.